The Yin Yang Bagua Hanger is the perfect portable protector. 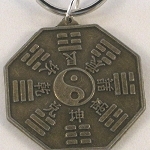 The Bagua with Trigram symbols surrounding the Tai Chi (Yin Yang) is a very powerful symbol of protection. Use this hanger to protect yourself all day and night from negative energy, negative situations, and negative people. Yin and Yang are the two energetic parts of the Tai Chi. The Yin half is relaxing, while the Yang half is energetic. The two sides complement and balance each other. The Yin Yang Bagua Hanger's charm (color and size of charm varies) is Bagua shaped to represent the Feng Shui Bagua map. The Bagua shape symbolizes harmony and fulfillment. 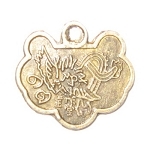 The Trigram symbols are ancient Chinese symbols that increase protection from negative energy. Approximately 6 inches long. 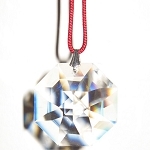 You can carry it with you in your pocket or bag, use it as a keychain, or hang it from the rear view mirror of your car. Compact and easy to fit almost anywhere.